The above is a Holter examination of a patient referred for evaluation of occasional complaints of pulsed beats. 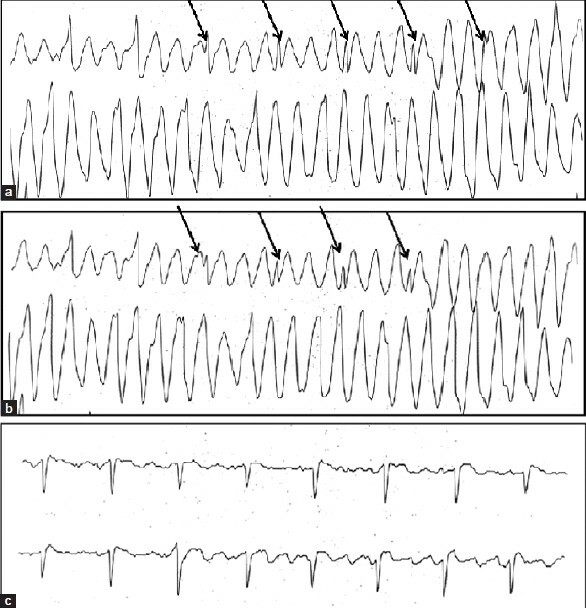 Holter analysis revealed bizarre wide QRS morphology which on initial examination suggested ventricular tachycardia [Figure 1]a-b. The patient was completely asymptomatic during the episode. The recording in channel 3 revealed a completely normal QRS pattern [Figure 1]c.
ECG artifacts can be confused with supraventricular or ventricular arrhythmias which can occasionally lead to unnecessary investigations and injudicious therapeutic interventions.